AnVir Task Manager Free is an alternative to the typical Task Manager you has available to you in Windows. It's the free version of a more advanced paid program by AnVir. The overall layout of AnVir Task Manager Free is pretty simple and provides access to a few different details about running tasks while also offering access to DLL libraries located on the system. This application also provides details about usage of CPU and memory. Version 9.2.3 is a freeware program which does not have restrictions and it's free so it doesn't cost anything. 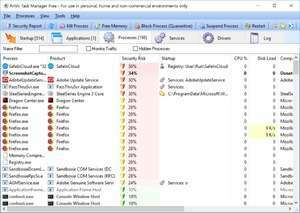 For security reasons, you should also check out the AnVir Task Manager Free download at LO4D.com which includes virus and malware tests. Additional screenshots of this application download may be available, too.